This post has been a long time coming. Finally my threats to celebrate the Constellation C-Shapes of the Sixties have become a reality. I have long had a particular passion and enthusiasm for the Connie C-Shape, the first of the 'modern' Constellation models. I believe it is one of the most under-rated of all Constellation designs. In this somewhat irreverent essay I offer some thoughts on the design context of the C-Shape model and survey of the various models available. The model I have has thicker hour markers along with dauphine style hands (a style that seems to be more common on non C models) compared to the examples you have shown. I think in one of your other write-ups you noted it wasn’t uncommon for Omega to use different style hour markers and hands on the same watch model. Was this also the case with the C? The Dial is a grey sunburst pattern. Above the Constellation imprint is a ‘MEISTER’ imprint. I have yet to find any meaningful information on what this means? What I have read has been the ‘MEISTER’ imprint is for models using higher quality parts or it was some sort of regional branding. This watch was purchased around 1967 in Europe, possible Switzerland or the UK. Any thoughts on the meaning? As a side-note this watch was given to my father as an engagement gift by a close family friend. Nearly 38 years later that family friend’s granddaughter became my wife - a full circle of events. Hopefully I will be able to pass this watch on to my son or son-in-law at which time a copy of your article will also be included. I do love to hear stories like yours and clearly you have an heirloom and precious object in which to pass down the generations. To answer your questions. Most certainly the watch was originally purchased from Meister, a high-end Swiss Jewelery chain that still exists today. On rare occasions, and only for special clients, would Omega consent to align its brand with another brand. The Meister example was one of the few. Im curious about the hands. Best send me a good picture and I'll have a closer look. Just click on the 'about me' link on the RH column and theres an icon for email. 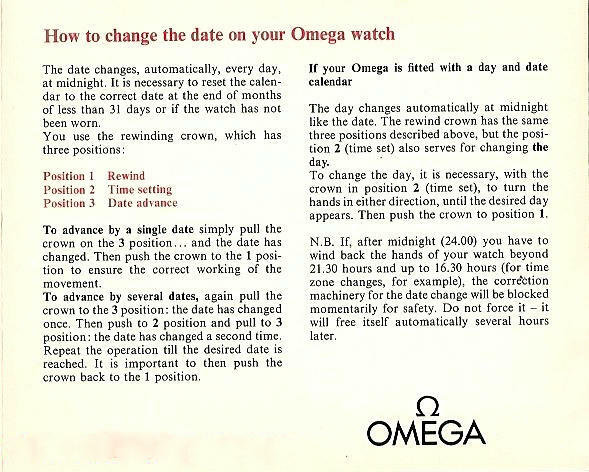 I have worn my gold plated (I was since told by an Omega service rep that it should be called "gold filled") Omega Constellation Day/Date Automatic C-Shape watch almost everyday since I bought it in 1972 (that's 37 years for those who can't count). I just tested it against an online atomic clock and it tends to lose 1-2 seconds a day. I still haven't seen anything that looks as simple and elegant as this Omega. Anyone know its market value. It shows the dings and scratches of 37 years, but only if you look close. My Speedmaster is in for cleaning and oiling and needs some cosmetic parts (crystal, bezel, face) but that would run into some real cash ($1600+ from Omega). Great testimonial :) These movements were some of the best. I expect the value would be anywhere from 400 - 900 depending on condition, but in time I believe they will appreciate well. Have you got a local watchmaker who services Omegas and who has worked with Speedies. I'm sure you would be able to do better than that price for a service. My every day watch is an Omega Constellation "C" shaped, cal. 1021, chronometer, from 1972. The automatic module has some wear and I removed it (here in Baja is some difficult if not impossible to have replacement pieces), so now works on manual wind. I wear it every day for years, and tested it against an online atomic clock and it tends to win 5-6 seconds a day (while wearing on wrist ) and lose 4 seconds a day (position 3 up). Basically has the exact time all the time. What a fantastic machine! Excellent performance for a 40 year old watch. Great essay as always Desmond. Very educational. I'm actually looking into buying a "birth date" Connie C. Just one question, I saw a dauphine hand Connie C on a forum. Were they ever produced with these hands? Best. Re Dauphine, I have heard people swear that D hands were on a watch since birth, but they just dont fit the design narrative of the C-Shape at all. It is true that Gerald Genta specified stick hands in his designs, and, to my mind, that is the standard. There are many explanations for Dauphine hands, from changeover at service (stick hands are delicate and have known to wear at the sleeve) to specification by certain retailers, but dauphine hands are from an earlier era and are just not part of the 60's 'thing'. I've been trying to take on board your advice and feedback about avoiding fakes and frankens - can I check my understanding so far with a listing I think might have issues? At first, I thought it passes the MOY test but now I'm thinking the Y isn't quite inline. Although the caseback reference matches a 564 from 1967 and the movement serial number matches 1966/67 on chuck maddox's list, the caseback itself seems to have some serious issues - the perlaging doesn't look right, the font for the reference is too modern and doesn't match the rest of the case back and I don't know what happened to the observatory on the back. The case seems to be missing the mirror polished chamfer, looks a bit fat and the bezel (although hard to see in the photos) doesn't look sharp edged enough. If I look at the movement, it's beautifully shiny but the rotor and the train bridge (think I got that right) are a different colour to the rest of the movement suggesting that it's either been repaired or is not necessarily what it appears to be. I'm not convinced by the serial number font either - it looks like it's been machined by modern hardware. Am I on the mark with these or am I now completely paranoid? It would be great to know if I've spiralled out of control. Nope, you're not getting paranoid, rather a good appraisal I think. You've pick ed the MOY issue, although some later genuine dial were out of MOY. This has a refinished dial, not a bad job at all, but the uppercase lettering doesn't have serifs and the s running into t in Constellation, for example, is not correct. Case back is genuine (as they havent yet faked these cases to my knowledge) but medallion is, as you say, completely worn. Movement generally looks tidy, no rust on the SS parts, a few scrapes on the bottom plate by the look of it though. Serial and calibres stamps look ok to me Stuart - there was a bit of variation and I dont see them as having been engraved. The original finish on the upper case has been completely polished away. My view is that this is a tired old tart who's been given a quick make-over. I think you can do a lot better. Good luck in your search, and more power to your elbow for posting an appraisal rather than a request to look over an eBay watch. I'm glad that I found this amazing blog about Omegas :-). I'm the owner of Constellation C-Shape watch which my grandfather gave me a few years ago. I took off the gold bracelet and it's been my daily watch since then. Recently it fell to the floor while I was trying to put it on and one of the baguette markers just came off and was moving freely beneath the crystal. I took it to a watch repairman and he fixed that, but later on I realized the inner machinery sort of came loose and I couldn't see that "Swiss made" in the bottom of the dial any more. I took it to the Omega dealer in Taipei and they showed me a picture of that part. As for the picture, it looks like that "Swiss made" is already printed on the dial. I was wondering if there was a separate part (maybe any kind of exterior ring with that inscription) or actually it's on the dial itself. This issue has got me really intrigued since I cannot understand how come that inscription is missing. Do you have any idea? Thanks a lot for your time and congratulations for your blog and such detailed entries. The more I read the entries the more in love I am with Omegas! Hmm, should have Swiss Made printed. Maybe your grandfather had the dial refinished during a service? Click on the 'View my complete profile' tab on the rh column and then click on email. If you can send me a good quality closeup I can take a look. That's what I think too, especially because I can perfectly recall the inscription printed in the dial before. I've been thinking about it recently and I think the only explanation might be that I still wore the Omega for a couple of days until I took it to the repairman, so I guess the baguette marker might have completely scrapped that "Swiss made" because of the movement. I'm taking the watch to another repairman in a few days, since the machinery is still a bit loose, and I'll ask him to try to find any trace of that inscription. Whre may I buy a leather bracelet for the j168.029 constellation chronograph? I aso need the buckle. Should I buy 18, 19 or 29 mm? You can buy genuine 19mm leather Omega straps at any Omega service centre of retail outlet. Original buckles from the 1960s are harder to find. However sometimes a batch of copies appear on eBay and that is an option. Yes the 14393 doesn't normally have the "officially Certified" lettering. With a 17 million serial number I would date production of the watch to around mid 1959 and so the watch is one of the earliest examples of the 14393. I am assuming the watch is 18k solid gold with a solid gold bracelet? As far as value is concerned, condition determines whether the watch will be in the upper, mid or low value range and so I would have to see some photographs of the watch to make a reasonable estimate. If you like, write another post on this site, giving your email address. I wont publish the post and will email you privately. Hi can I check with you if this is authentic? Looks okay to me. They haven't included a photograph of the movement and so I cant confirm it is fully correct. the reference 168.017 also fitted the caliber 751? Hi Desmond! I am looking to purchase this Constellation 168.017 C Case and wanted to see what you thought. I am confident the case and dial check out but am unsure if the movement dates correctly with the case. the movement is a 564, 26,000,000 which would date it to 1968 but I checked a few of your resources and wasn't sure if that case reference was made as late as '68. Any info would be greatly appreciated! Yep, serial is fine for this model. Very tidy C Shape and at a very reasonable price. What is your opinion of it. I bought it..... the start of my Constellation Collection. I'am in the fever for the "C". The price is around 350-380 US Dollars. By the way the other one that you told me it was okay, turns out that it is completely original, and keeps its time perfectly. For that price Luciano, it isn't bad. The dial has some degradation and the case has lost most of its original finish.